Copyright (c) 2009 Rubyworks. All Rights Reserved. How about a Change Log in glorious technicolor! Or a Release History to make you feel like a schoold girl with a box of crayons. VCLog can provide a changelogs in a variety of uniform formats for different SCMs. If we ask vclog for help will see it's commandline interface is fairly self-explanatory. Without any format selected, vclog will use the ANSI-colored GNU-like format. 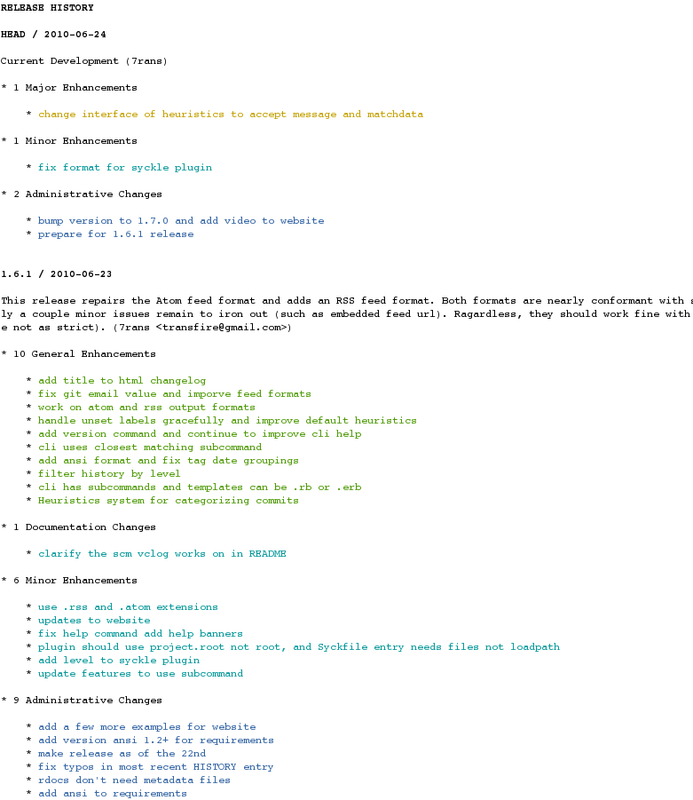 Here is an example of the non-colored GNU format. One of the coolest features of vclog is it's ability to lookup tags and build a Release History file. A variety of formats are available for Change Logs and Release Histories, Here are examples of VCLog's own. Finally, VCLog recognizes commit types through a set of heuristics. You can define you own set by creating a `vclog` block in a config.rb file or .config.rb. See VCLog's own file for an example. By default VCLog heuristics recognize a single-word marker placed at the beginning of the commit message separated by a colon, or placed at the at the end of a commit messages wrapped in square brackets. It you utilize these, e.g. git commit -m "bug: fixed foo issue" or git commit -m "fixed foo issue [bug]", then you can sort the changelog output by type. You can see this already in the previous examples. Out of thebox VCLog recognizes major, minor, bug, doc and admin. Any other label is treated verbatim, e.g. doozy would show up as "Doozy Enhancements". 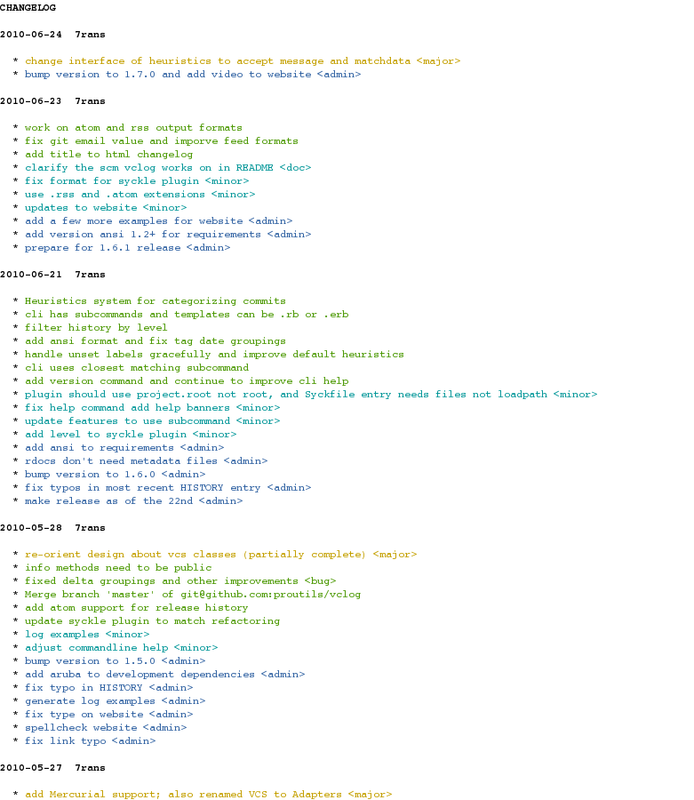 Commit types can be a very useful way to categorize your commits and thus present more readable changelogs. Wouldn't it be nice if SCMs supported commit types directly? VCLog's code repository is hosted on GitHub. If you have a feauture question, or a problem to report please do not hesitate to sumbit an issue report. Our development Logs may also be helpful.